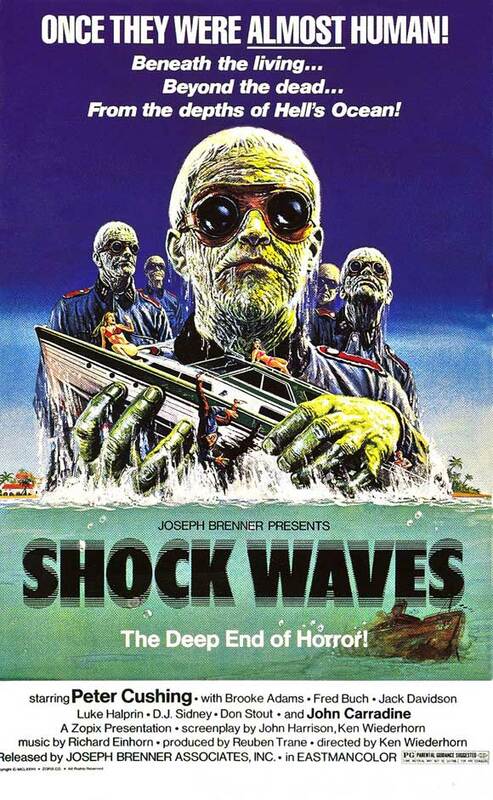 SHOCK WAVES *** USA 1977 90 mins Dir: Ken Wiederhorn. 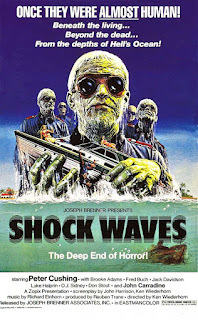 There are familiar, fashionable post-JAWS scenes of a subjective underwater menace causing schools of fish to flee, somewhat predicting the zombie-shark interface in Fulci’s ZOMBI, though many scenes possess a uniquely eerie charge - particularly the striking image of several blonde, goggle-sporting Nazi zombies rising up from the water like they’re in some long-forgotten SS enhanced retro rock music video. It’s a slow-burn and the talented Adams is reduced to a reactive eye candy screaming role, though Cushing, on Basil Exposition duties, is typically commanding as the surviving member of a German team responsible for creating “Death Corps”, a special unit of “perfect soldiers” designed for underwater use.